Why Be Normal? Pull it or Push it! When you’re talking film photography, there is nothing quite like black and white film. All film is wonderful, of course, and I occasionally love to put a roll of Portra 160 or 400 colour negative negative through my 6×6 when the location or moment calls for it. But as good as all those colour films are none of them, in my opinion, can do what black and white film can do. None of them can really be pushed or pulled. If you are just starting out with film photography and have started with black and white film you are in for a great time. One of the most beautiful things about black and white film is how very manageable it is when it comes to interpreting your personal vision of a moment, as it pertains to exposure and development. How manageable? Well, if you understand the basics of The Zone System, can meter a scene and can develop your own black and white negatives…very. Ansel Adams is the creator and master of Zone System placement, development and printing. Not only was he an incredible photographer, but he was a scientist and teacher and created this system so that people could visualize the scene in their head and be able to follow a recipe of sorts from beginning to end to get that scene on paper. If you haven’t aleady, I highly recommend picking up a copy of The Negative (he also wrote The Camera and The Print). Put very simply, a negative is nothing more than recorded light and time. The mood and tone of the negative will depend upon how much of each you give. When you are visualizing the scene in your head, somewhere along the way you need to decide if you want your image to be an exact copy of the literal world, or do you want to see more or less in the shadows. Once you have this answer, you now know whether you want a normal exposure or whether you want to push or pull the film. You may have already heard the term push-pull process. Some have referred to this technique as an error on the part of the photographer, maybe he/she forgot what speed they were shooting and improperly metered their scene. I disagree with this analogy. I like to use push or pull (or normal) exposure and processing to better communicate my personal vision. It’s all about contrast, shadow detail and mood. The image you see below was done using pull processing. 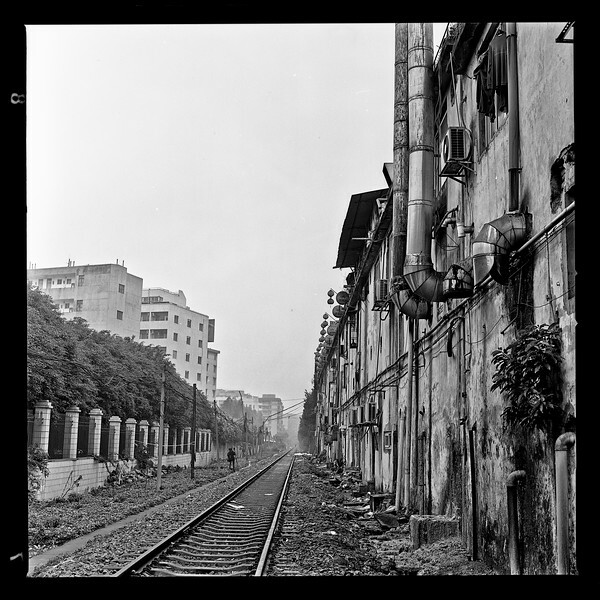 A section of railroad tracks in Yuexiu district, Guangzhou. This was shot on a Hasselblad medium format camera and 80mm F2.8 lens. The film was ISO 25, however I metered it for ISO 10. An extremely weak solution of Blazinal at 1:100 was used. The point of pull processing is to get shadow detail. You are effectively over-exposing the film, so you have to be careful not to develop for too long or with too much agitation because you want to keep the contrast down. The final result is a soft, gray negative. There are no real hard blacks or piercing bright whites. This kind of look is reminiscient of 1930’s or 1940’s photography. The good thing with this kind of negative is you have a lot of room to play with it. You can leave it soft with low contrast or use software to punch up the levels and contrast with Photoshop or when you print in a traditional darkroom. The opposite to pulling the film is to push the negative. This image is an example of push processing. 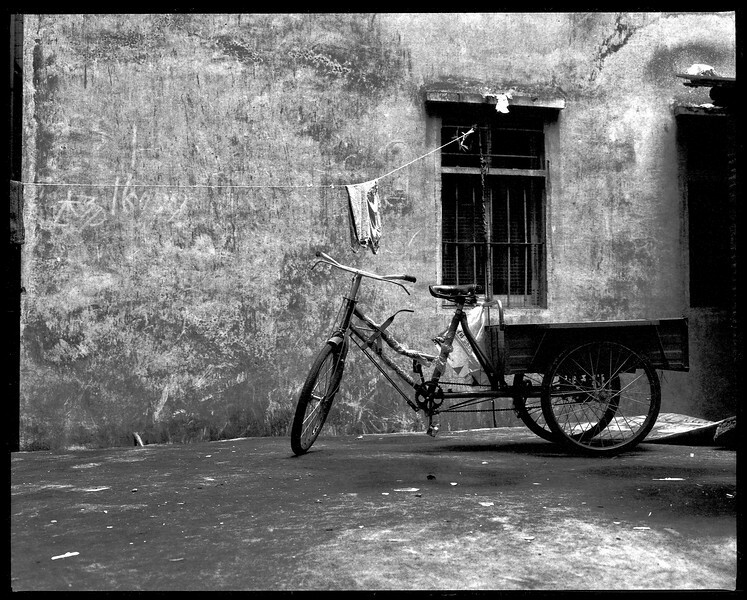 This was shot with Lucky SHD 100 and metered for ISO 400. D-76 in stock solution was used. I purposely underexposed the film, knowing I would over-process it later. By underexposing the film I am losing shadow detail. By overdeveloping the film, with strong agitation, I am increasing contrast and grain. The feeling is immediate. It is gritty, edgy and hard. This is definitely not the technique to use for your wife or girlfriend, but if you like strong, forceful images this is the way to go. So whether you want a normal exposure/development or you want to push or pull the negative, its all about understanding Zone System theory and visualizing your final image.